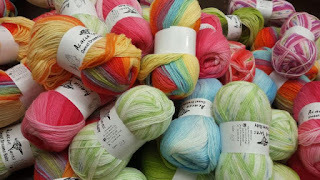 Yarn and Fiber Happenings: Friday Nights are Hosted by Gina! I needed to drop by on Friday to see how the Friday Night Knitting Club was doing. Last week we had noticed a fairly full parking lot, and it is a big lot, they can't all be here for knitting, can they? Well most of them were! This Friday wasn't quite so hectic, at least early on while I was there, Gina draws quite a crowd though. Gina was taught to knit by her great aunt when she was a child, and started again about six years ago when she was pregnant with son Ben, you know how that is! After Ben was born, Gina took on the new mother lifestyle together with a new passion for knitting. For most of us this would be more than enough, but not for Gina, she started the "Manch Vegas Knitters" (Manchester New Hampshire) with Ericka, now about 40 members strong, and has been hosting a pod-cast and blog "Sleepy Eyes Knits" for about a year, she teaches yoga too! Gina met Kate Jacobs, author of "The Friday Night Knitting Club" at a book signing at Barnes and Nobles and was inspired to offer to start one at our shop. You can join her any Friday night between 6:00pm and 9:30pm.